Posted by Emily Bache on 2018-10-02 at 09:11 under Experience Report. 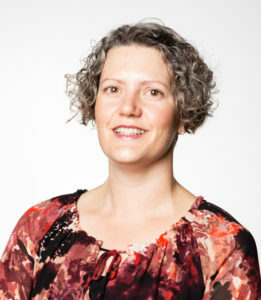 Comments Off on Effective Technical Agile Coaching. As a woman programmer, I have noticed there is something of a gender imbalance in my profession. It’s an issue that’s interested me for a while, not least because people often ask me about what we can do to improve the situation. For myself, I enjoy writing code and I think it’s a great career. The sexism I’ve been aware of has not made a big impact on my life, although I know not everyone has been so fortunate. Susan Fowler’s blog really shocked me earlier this year. I have had some bad experiences, but not like that. 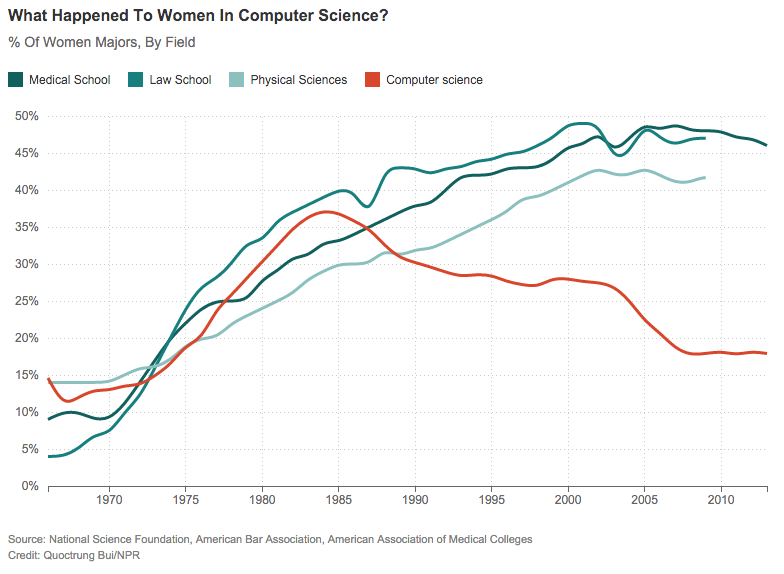 The percentage of women studying Computer Science suffers a trend reversal in the mid 80’s, while the other subjects don’t. The explanation given, is that it’s about then that home computers began to appear on the market, sold as a toy for boys. I lived through that time, and yes, my family bought a ZX Spectrum in the mid 80’s when I was about 10 years old, and yes, my younger brother learnt to program it and I didn’t. Fortunately I managed to learn to program later on anyway. 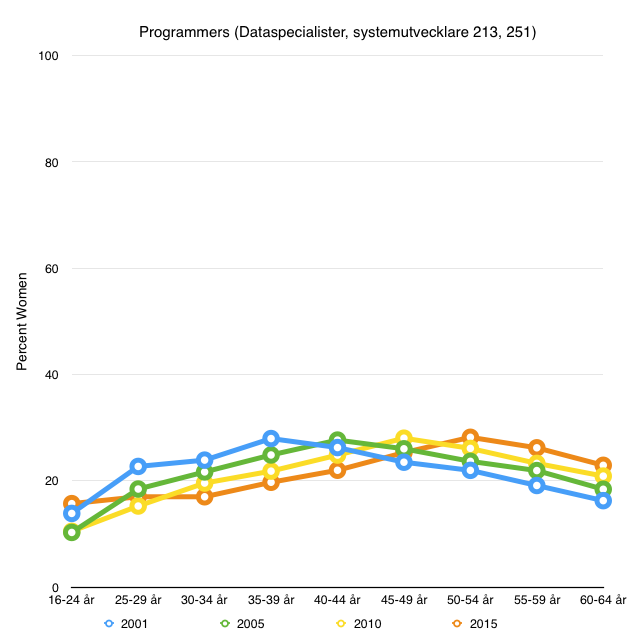 So I became curious to see whether the same thing happened in Sweden – did the proportion of women computer scientists also drop in the 80’s? I discovered that the Swedish statistical authority collects and publishes data on this kind of thing, and you can search it via a web gui. I started poking around on it and soon I was hooked. Loads of really interesting data lying around waiting to be analysed! Although the proportion of women in engineering is pretty low compared to the other subjects, it’s encouraging to note that the proportion has increased more than the other subjects. It’s now at a similar level to where doctors, lawyers and architects were thirty-five years ago. (I was disappointed not to find any data for Natural Sciences. I’m not sure why that’s excluded from the source database). Anyway, I’m not seeing this trend change in the 80’s, the curve is fairly smoothly upwards. I suspect the subject breakdown isn’t detailed enough to pick out Computer Science from the wider Engineering discipline, and that could explain it. If you look at the blue curve for 2001, you can see it peaks at age 35-39 years – that is, there were a higher proportion of women programmers at that age than other ages. If you were 35-39 in 2001, you were probably doing your studies in the mid to late 80’s. Notice that the proportion of women at younger ages is lower. The green and yellow curves for 2005 and 2010 continue to show the same peak, just moved five years to the right. The proportion of women coming in at the younger agegroups remains lower. The orange curve for 2015 is a little more encouraging – at least the proportion of women in the youngest two age-groups has levelled off and is no longer sinking! 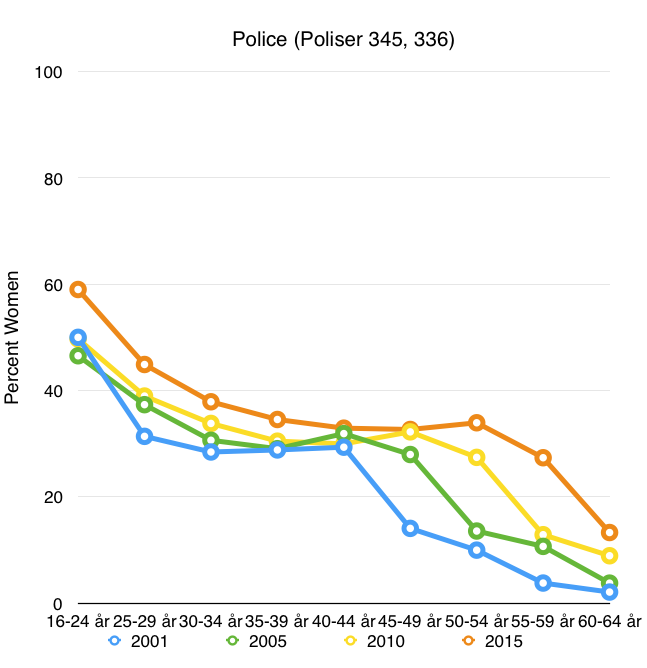 So it looks to me like there was a trend change in the mid to late 80’s in Sweden too – the proportion of women entering the profession seems to drop from then on, based on this secondary evidence. I imagine that computers were also marketed here as a boy’s toy. 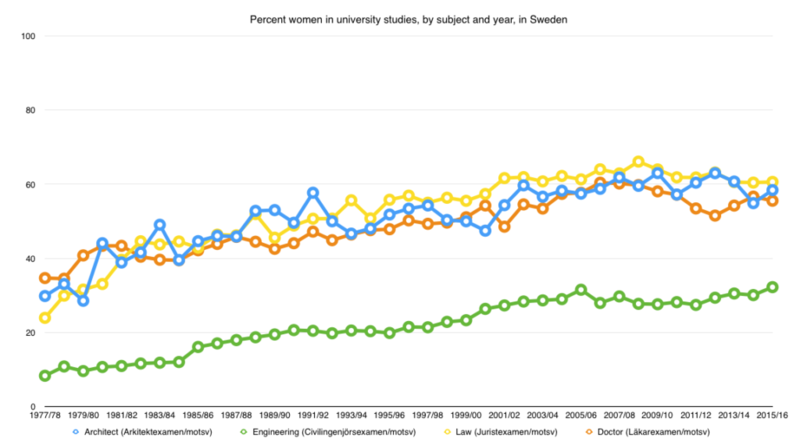 I really hope that things are changing today in Sweden, and that more women are studying computer science than before. For reference, I did similar curves for several other professions, using the same dataset. 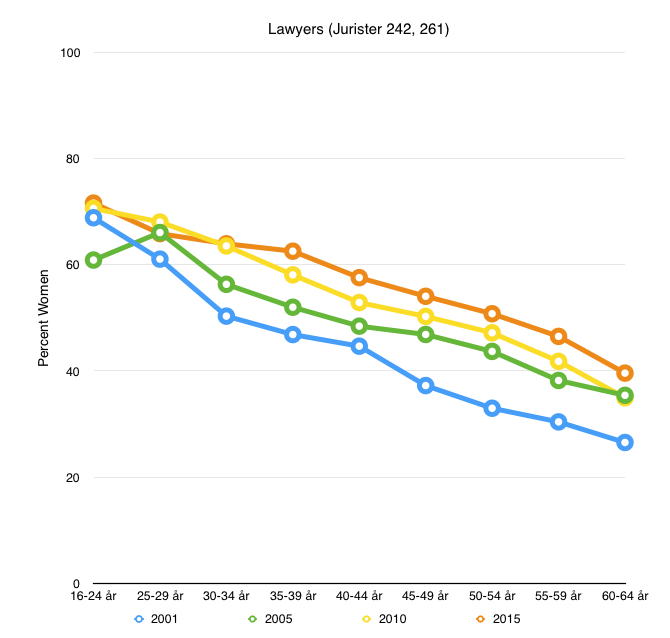 So there are a lot of women lawyers out there, and the proportion looks to be continuing to increase. Male nurses seem to have things worse than female programmers, unfortunately. Plus I can’t see any real trend in this graph – the situation is bad and fairly stable. The proportion of women police officers levelled off for a while but they’ve managed to turn things around, and it is now increasing again. Posted by Emily Bache on 2017-04-19 at 15:05 under Opinion. Comments Off on Proportion of Women Programmers. The life of a consultant has drawn me back, but perhaps surprisingly, this time it’s not a return to my one-person firm. Rather than reinvigorating Bache Consulting, I’ve decided to join Praqma, the Continuous Delivery and DevOps Company. I was pretty happy at Pagero. I’ve successfully run my own business before. Some of my friends think I’m crazy to leave a good job with a great team working with exciting technologies. Others think I’m crazy to not want to be my own boss again. Writing code is really good fun. Writing code that people actually use is even more fun. That’s one of the reasons I like setting up Continuous Delivery pipelines for a development organization. Anything you change gets used almost straight away, and you get feedback from people around you all the time. It’s a fantastic feeling when you implement something that means the whole development team can move forward more quickly, confident in the quality of what they’re producing. The kind of work I’m talking about is setting up build and delivery pipelines using a CI tool like Jenkins or Go.CD. It’s automating all the installation steps needed for a new machine in a staging environment. It’s moving all the code into a modern DVCS like Git, and setting up automated processes to help keep the master branch in a working state. In my experience, this kind of work gives you the opportunity to raise the productivity of so many other people, it can have far more impact than if you stayed in your cube hacking on a product by yourself. Another activity I really enjoy is facilitating and teaching. Preferably that kind of teaching that you do from the back of the room, where your job is to set up situations where learning is inevitable. I’ve spent a lot of time over the years facilitating Coding Dojo meetings, and more recently I’ve started doing more Mob Programming with teams. My aim is usually to get people to experience effective development practices like Test-Driven Development (TDD), and understand the difference it makes. Again, the focus is on raising the productivity of other people, this time through coaching and training. Actually, I’m not directly raising anyone’s skill level. What I’m trying to do is to activate people’s innate motivation to want to get better at their job, and showing them a way to do that. It goes hand in hand with making the technical environment they’re working in conducive to good practice by having good automation infrastructure. TDD makes a lot more sense when you have a CI system to run the tests, and information radiators that show you when the build is broken. So I’ve just joined Praqma, which is a consultancy focused on Continuous Delivery and DevOps. I now have a host of colleagues who are also really skilled with this kind of technical coaching role I just talked about, and know how much fun it can be. We’re really good with tools like Jenkins, Docker, Artifactory and Git, we set up Continuous Delivery pipelines, and we coach developers in how to use them. What we’re finding though, is that once we’ve got all that set up, the next step usually involves improving the automated testing in the pipeline. We need to be there coaching developers in TDD, and getting automated system tests set up. That’s where I’m hoping my joining Praqma will help us all to raise our game. Starting with the consulting work Praqma already does, which of course lays the foundations with Continuous Delivery, we can start doing more coaching in test automation. I have long experience of that, teaching TDD in particular. I have much less experience of some of the other things that Praqma does though. What I’m hoping is that by working together with the other consultants at Praqma, and collectively sharing our toolboxes, we can all have more fun and achieve more for our clients. I don’t mind working alone at a client, I’ve done it before, but having colleagues is so much better. We’re going to have a blast! Praqma is expanding throughout Scandinavia right now, with offices in places like Copenhagen, Oslo and Stockholm already. I’m starting the office in Göteborg. If the kind of technical coach role I’ve just described appeals to you, I’d be delighted to tell you more, do send a mail, emily.bache@praqma.com, or a tweet, I’m @emilybache. We’re not only looking for senior people with lots of experience, by the way. If you have the right attitude and willingness to learn, that can take you a long way. We’re looking for people to join Praqma at all our offices, please send your resume and a covering letter to jobs@praqma.com. Of course I’d be particularly pleased if you wanted to join me in Göteborg. Posted by Emily Bache on 2017-03-16 at 16:02 under Autobiographical. Comments Off on Technical Coach with Praqma. Last week I met Woody Zuill when he came to Göteborg to give a workshop about Mob Programming. At first glance mobbing seems really innefficient. You have a whole team of maybe 6-7 people sitting together all day, every day, programming at one computer. How could that possibly be a productive way to work? I’m pretty intrigued by the idea. It reminds me of the reaction people had to eXtreme Programming when they first heard about it back in like 2000. Is it just an off-putting name for something that could actually be quite brilliant? There are certainly some interesting people who I respect, talking warmly about it. The thing is, when it comes to working together with others, programming at one computer, I’ve had some mixed results. Sometimes good, sometimes less good. I’ve done some pair programming, and found it worked well with some people and not others. It’s generally worked much better when I’ve paired with someone who has a lot of useful knowledge that I’ve lacked. Either about the language and frameworks we’re using, or about how the software will be used – ie the problem domain. I’ve found it’s worked a lot less well in other situations, with other people. I find it all too easy to hog the keyboard, basically. So I do pair, but not that often. With ‘Randori’ style coding dojos, the idea is that you have a pair at the front who code, and switch one person every 5-7 minutes, or every test case. I’ve facilitated a lot of these sessions, and I find them especially useful for quickly getting a group of people new to TDD all up and running and pointed in the same direction. Recently I’ve been doing it only for the first session or two, instead having everyone working in pairs most of the time. As a facilitator, this is far easier to handle – much less stressful. Managing the interactions in a bigger group is difficult, both to keep the discussions on track, answer questions about the exercise, and to maintain the pair switching. I also find the person at the keyboard easily gets stressed and intimidated by having everyone watching them, and often writes worse code than they are capable of. So I do facilitate whole-group Randori sessions, but not that often. So I wanted to find out if mob programming had similar strengths and weaknesses. In what situations does it excel, and when are you better off pairing or working alone? Would I find it stressful, like a Randori? Would I want to drive most of the time, as in pair programming? Woody turns out to be a really gentle person, about as far away from a ‘hard sell’ as you can get. He facilitaed the session masterfully, mixing theory and practice, telling us stories about what he’s found to work and why. I am confident he knows a lot about software development in general, mob programming in particular, and he is very humble about it. The most important insight I gained from the session, was that I need to get good at ‘strong-style pairing’. That seems to me to be at the heart of what makes Mob programming work, and not be stressful like the Randori sessions I’ve been doing. I think it will also help me to get pair programming to work well in a wider variety of situations. I have heard about ‘strong-style pairing’ before, from Llewellyn Falco, who invented it, but I havn’t really experienced it very much before, or understood how important it is. Do go read his blog post about it, for a fuller explanation of what I’m talking about. The basic idea is “For an idea to go from your head into the computer it MUST go through someone else’s hands”. That forces you to express your ideas really clearly, in words, first. That is actually pretty difficult when you havn’t done it much before. The thing is, that if you do that, then you open up your programming ideas for discussion, critique, and improvement, in a way that doesn’t happen if they go straight from your head through your own hands into the computer. I think if I get better at ‘strong-style pairing’ it will help me not only with Mob programming, but also with pairing and facilitating Randori dojo sessions. Probably also with programming generally. Pairing has worked best for me when I’ve been driving, and my navigator is good at expressing ideas for me to understand and then type. I think I need to get good at that navigator role for the times when I’m the one with more ideas. I need to learn that when I think ‘I have an idea about to solve this problem!’ I should hand over the keyboard, not grab it. I need to learn to express my coding ideas verbally. Then I will be able to pair productively with a wider range of people. So thanks, Woody, for taking the time to come to Göteborg, sharing your experiences and facilitating a great workshop. I learnt a lot, and I think Mob Programming and Strong-style pairing could quite possibly be some of those brilliant ideas that change the way I write code, for the better. Posted by Emily Bache on 2016-09-19 at 14:27 under Coding Skills, Experience Report. Comments Off on Mob programming and strong-style pairing. I’ve been interested for a while in the relationship between TDD and good design for a while, and the SOLID principles of Object Oriented Design in particular. I’ve got this set of 4 “Racing Car” exercises that I originally got from Luca Minudel, that I’ve done in coding dojos with lots of different groups. If you’ve never done them, I do recommend getting your editor out and having a go, at least at the first one. I think you get a much better understanding of the SOLID principles when you both know the theory, and have experienced them in actual code. I find it interesting that in the starting code for each of the four Katas there are design flaws that make it awkward to write unit tests for the code. You can directly point to violations of one or more of the SOLID principles. In particular for the Dependency Inversion Principle, it seems to me there is a very direct link with testability. If you have a fixed dependency to a concrete class, that is always going to be harder to isolate for a unit test, and the Tyre Pressure exercise shows this quite clearly. What bothers me about the 4 original exercises is that there are actually 5 SOLID principles, and none of them really has a problem with the Liskov Substitution Principle. So I have designed a new exercise! It’s called “Leaderboard” and I’ve put it in the same git repository as the other four. I tried it out last week in a coding dojo with my colleagues at Pagero, and it seemed to work pretty well. The idea is that the Liskov principle violation means you can’t propely test the Leaderboard class with test data that only uses the base class “Driver”, you have to add tests using a “SelfDrivingCar”. (Ok, I confess, I’ve taken some liberties with what’s likely in formula 1 racing!) Liskov says that your client code (ie Leaderboard) shouldn’t need to know if it has been given a base class or a subclass, they should be totally substitutable. So again, I’m finding a link between testability and good design. Currently the exercise is only available in Scala, Python and Java, so I’m very open to pull requests for translations into other programming languages. Do add a comment here or on github if you try my new Kata. Posted by Emily Bache on 2015-06-02 at 10:06 under Code Kata.